choir croak out them goodies: I'll be darrrrrned (or, get hooked on Murder Mystery...har har harrr). I'll be darrrrrned (or, get hooked on Murder Mystery...har har harrr). Today is/was Talk Like a Pirate Day, which meant one of two things: first, that you should have sent a thank-you letter to Keith Richards, and second, that you should have made the effort to include the letter “r” in conversation today. Talking like a pirate bears similarity to talking like a Swede, what with that harsh emphasis on the letter, only Swedes don't have hooks for hands. Except the amputees, of course. 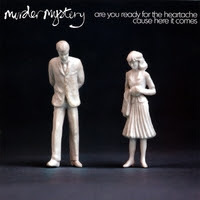 Anyway, Murrrrrder Mystery (known on any other day as Murder Mystery) is a band out of New York whose publicist guarantees a “rumpshaking live show” and a “'rock or die' attitude.” Naturally, these sort of terms make me skeptical, and usually with good reason. In this particular case, the band doesn't offer much “rock or die” urgency, and as of yet, I've been unable to see their New York performances so I can't confirm whether their show is more “rumpshaking” than their debut album, which is less than such. But with every weed comes a blade or two of green grass, and so the band has a few upsides. Getting beyond the terrible album title (Are You Ready for the Heartache Cause Here it Comes), the cliches within (inclusion of brother and sister, female-male harmonies), and song titles that far too intentionally aim to get the band talked about from a retro perspective (“Honey Come Home,” “Baby, You Can Write Me a Letter,” “What My Baby Said,” “In a Sentimental Mood”), the '50s rock and roll influence on Are You Ready is almost sort of charming. From the start, there's a background rhythm addition of piano, and a retro surf-rock vibe that goes into a slow doo-wop guitar on second track “In a Sentimental Mood.” Still, the slow retro-indie style gets a bit tired by the twelfth track, though by this time we've heard toned-down classic country (“Think of Me” and “Cold, Hard Workin' Man”) and the most happy-making of musical elements, the hand clap (“Baby, You Can Write Me a Letter”). Topping all this off is vocalist Jeremy Coleman, who brings to mind – of all singers – Kevin Griffin of Better Than Ezra, though what he does for the music is very much to the effect of Tony Lowe, meaning his safe, unvarying voice either makes Murder Mystery an easy, peaceful listen, or a grating delve into monotony. Not for everyone, but undoubtedly for lovers of easygoing pop.